Most certainly, but the trouble is that since it's a remote server, I can't arbitrarily grab the data without some mod inside the client grabbing and caching chunks, then doing local rendering of the type that I want. I take it using a map isn't what you're going for at all, Kerm? No, I'd like to be able to post cool birds-eye views of what I'm working on, at least as far as my above-ground structures go. I flew around today on my server and grabbed some screenshots of some of the structures on mine. I know i missed some. Also in the gallery are some from a buddies server and my fun with world edit. Those are awesome, thanks so much for sharing! Did you build all the stuff on your server from mining resources, or was that worldedited as well? 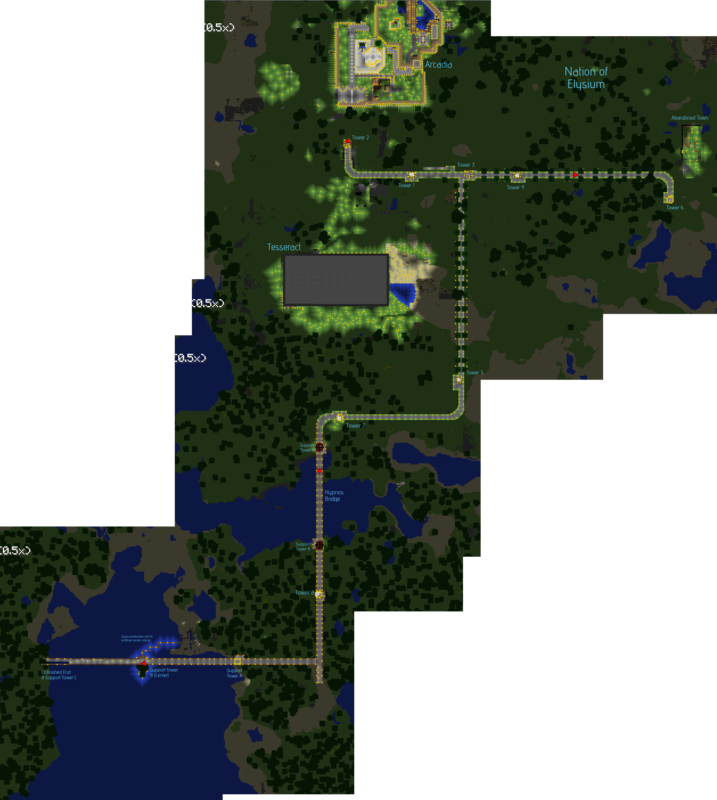 Nothing is world edited on my server at all All by hand. There are only 2 structures that were made by giving all the items for, but that was from an old admin i don't have around anymore since he abused /give and No one else used it to get items so his powers go stripped. All hard work and time for my structures. Also the 2 un legit ones I didn't show in the gallery. Wow, that's super-impressive, then! Very nicely done. Sounds like a great plan to me. It was nice to have you all on Evocat.us last night, by the way; I got ElderofMagic to add you guys as Arcadians so we can /tc and you can use my chests of resources. Cool. Then we can also stress test my server at the same time And great! I set my home in one of your towers, cause if i died again i was going to fly all the way back. But your towers are amazing, ill have to check them out again when I'm not so tired. Thanks. I'm having fun with them, and I'm glad to be able to join a bunch of cool resources (including a link into Arcadia itself, and my mountain-side picture window palace) into one huge network. Eventually I'll probably want to find a plot to make myself my own town, and find out how I can get it protected. Wow thats quite a project you have in mind there Kerm. gonna look awesome when its done. And take a good chunk of time. I wish you luck, especially when getting it protected. Thanks indeed. I once again wish there was an mGob for copy-pasting builds from one Minecraft server to another. Perhaps I'll have to learn how to mod Minecraft to make something like that possible. That would be cool. But I couldn't let you paste it on mine, cause then it would kinda be cheating since you didnt build it there maybe on my test server lol. Sounds like someone is wanting to host their own Minecraft server? This really isn't going to die is it? These are just as interesting as Freebuild screenshots! I used a map mod to take a picture of my Evocatus complex! Things you can't see include my vault room under the corner of Arcadia from Tower 1, tunnels that mirror most of the above-ground promenades, a triple spawner resource collector at Tower 6, and much much much more. Oh, and I have a huge glass-windowed room in the side of the mountain that forms the bottom of Tower 2. All the promenades are at level Y=112; I have a series of mines at the bottom of Towers 1, 5, and 6 at Y=12. © Copyright 2000-2019 Cemetech & Christopher Mitchell :: Page Execution Time: 0.153639 seconds.